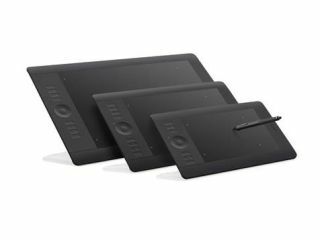 Wacom has unveiled a new line-up of graphics tablets to slot into its professional Intuos line-up, featuring multi-touch gesture support. The tablets can recognise standard Windows and Mac gestures, such as zooming, scrolling and panning, but customisable gestures can also be created for quicker workflow in programs such as Adobe Photoshop. Four new models are available in the range, in three different sizes (large, medium and small). The medium model will be available without gesture control at a cheaper price point. A number of customisable ExpressKeys and one Touch Ring which can be used for up to four different functions are available for easy access to commonly used shortcuts and modifiers. A new Heads-Up Display (HUD) feature displays current settings on the computer screen, meaning users never have to look away from their monitor. The pen that comes with the tablet is the same as featured on the Intuos 4, with 2048 levels of pen pressure and up to 60 degrees of pen tilt available. According to Wacom, the pen emulates the same feel, response and effects as those derived from working with traditional tools such as paint brushes and markers. An optional wireless kit can be purchased separately, which converts the tablet into a wireless device. This includes a rechargeable battery. The Wacom Intuos5 UK price will range from £199.99 for the smallest up to £429.99 for the largest model. The Wireless accessory kit will be priced at £34.99. Available to buy now, the products will be displayed at the upcoming Focus on Imaging photography show taking place at the NEC from Sunday.